What do a Mexican wrestler and a Japanese man in pajamas have in common? Nothing, you will say. Yes, nothing, I will reply. But you know, I think Hitoshi Matsumoto might have a different idea on this matter. To this question he will probably show you his film Symbol as a reply. How do you connect then a Mexican wrestler with the awkward alias of Escargot Man and the Japanese man in pajamas? You watch Symbol. Simple as that. A Mexican family appears in the first sequence of the film. The father is a wrestler called Escargot Man. He’s a pathetic character, but he has to try not to lose his dignity in front of his son, who is a fan of his. 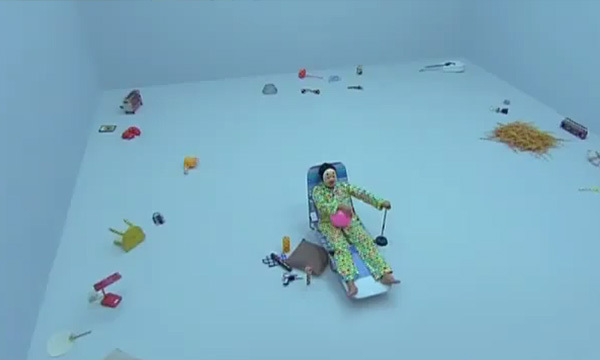 At the same time, a Japanese man in flashy pajamas wakes up in a brightly-lit room. Phallic symbols on the walls, when touched, conjure all sorts of crazy reactions – toothbrushes and endless supply of sushi coming out of the walls, among them – the man has to learn to make use of at his advantage, in order to escape. I’m always amazed realizing how quirky Japanese can get when they try very hard. I don’t think any other country in the world shares the eccentricity of Japan. In Symbol Matsumoto exploits his talent for the bizarre and his comedian flair, using every trick he has in store to steal the audience’s laughs. Some scenes are actually very funny, especially thanks to an incredible ability the filmmaker has for absurd elements. 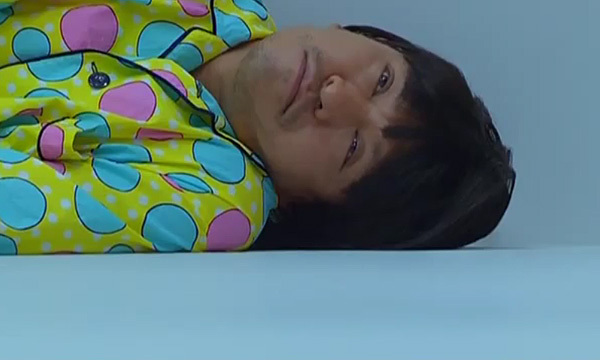 Hitoshi Matsumoto’s acting is also hilarious at times. Some themes which are recurring in Matsumoto’s films are also present, even if only as sub-themes, in Symbol. In general though it feels like some solutions are a little too easy and conceived for a very rough taste. 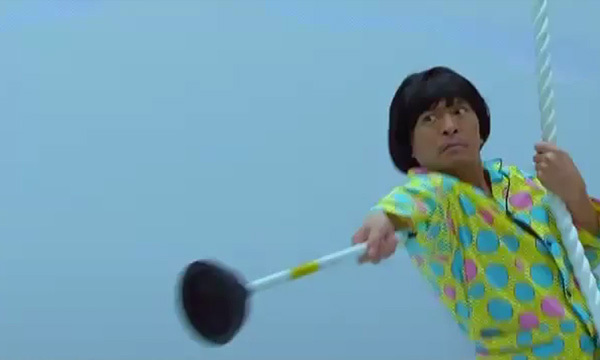 The use of cheesy computer graphics, which worked in a film like Dai-Nipponjin, is not working as nicely in Symbol, where premises are subtler and visual effects should have been more balanced. The structure of the film is its most interesting aspect. The movie is divided into three parts, each bearing a title and a goal. The first section is entitled “The Education” and it works as a learning phase in videogames. No wonder about getting inspiration from videogames for a film: they are a big part of contemporary Japanese culture. In the first section of the film the man in pajamas learns how the system works and how it can be used to solve complex problems. The second section is entitled “The Enhancing” and takes place after the man in pajamas has mastered the previous stage – he solved the given problem and gained access to the second level. Here the story of the man in pajamas connects with the story of the Mexican wrestler. The story of the wrestler proves to be functional to the story of the man in pajamas. The mystery of the two storylines bearing no common element is solved. The two stories become one, and together with the main character we can get to the next stage. The third and final section is called “The Future”. We finally arrive to a sort of open ending, but we have to put up with a very foregone conclusion and with the message that comes with it, which is all we are offered. If I say more about it, I could spoil the little there actually is to spoil in Symbol. Want to know if a film like Symbol is worth your time or not? Well, of course depends on what you are looking for, in the first place. Symbol must be taken into account especially as a comedy, as its main goal seems that of making people laugh at the amazingly conceived absurdities in it. There is a message in the film, as I said, but the way it was trotted out makes one feel it was very much adjusted to the rest in a hurry – even if probably it was not. Anyway, trust me, you don’t want to watch this film for its ending. Also, from a point on, the visuals become so very lame that, even knowing it must be intentional, they are truly annoying. So, worth the time or not? I think I can answer affirmatively. Especially if you are the curious type and you want to know how you can use a rope, a plunger and a piece of sushi in a constructive way.